BAGUIO CITY—One of the country’s 1,731 new lawyers quietly celebrated with his family on Tuesday. The following day, he reported back for work at the Commission on Audit office in La Trinidad, Benguet province, wearing his uniform. Roy Lawagan, who considered passing the bar an early gift for his 27th birthday on May 11, said he was staying on in his job until May 15. After that, he was taking up a cousin’s offer to work at a law firm in Manila. “I will go there to gain experience,” he said. While working as a security guard, Lawagan attended night classes on his first year at law school. It was tiring, he said, since his wife was pregnant with their daughter, now 4 years old. “Being a lawyer was my father’s dream,” he said. The fourth in a brood of nine, Lawagan said some of his sisters had graduated with degrees in political science but did not pursue law. 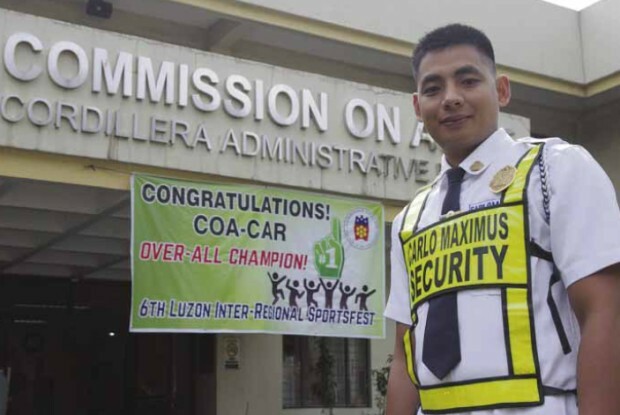 Lawagan, who traces his roots to Sagada in Mountain Province, completed his criminology course at University of Baguio and finished his law studies at Saint Louis University. When he did not pass the 2014 bar exam despite having enrolled in a review center, Lawagan decided to review on his own for the 2015 exam given in November last year.